Edward O.W. Whitehouse, “Wildman Whitehouse” as he generally styled himself, was a surgeon by profession and an electrical experimenter by avocation. 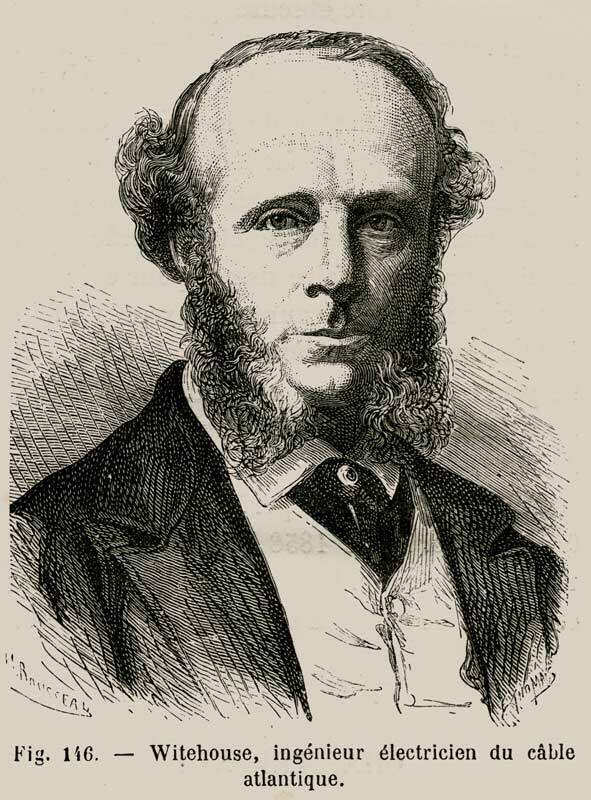 In 1856 he was appointed chief electrician to the Atlantic Telegraph Company and was responsible for the testing of the 1857/58 cables, and for the design and operation of the equipment which would transmit the telegraph signals between Ireland and Newfoundland. This extract from The Atlantic Telegraph: A History of Preliminary Experimental Proceedings and a Descriptive Account of the Present State and Prospects of the Undertaking (titled on the cover The Atlantic Telegraph: A Descriptive History), a 69-page pamphlet published in 1857 “by order of the Directors of the Company” gives details of Whitehouse’s electrical apparatus for sending signals through the cable. The bibliography in Bern Dibner’s 1959 book The Atlantic Cable also lists Mann as the author. In at least one copy of the book (Samuel Morse’s own copy, given to him by Cyrus W. Field and now at Cornell University’s Kroch Library) the initals “R.J.M.” appear on page 69, the last page of the text. In other copies the initials have been overprinted with a black bar. Mann and Whitehouse were close contemporaries, Mann being born in 1817, a year after Whitehouse. 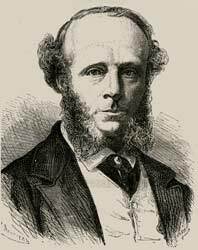 Mann studied medicine at University College, London, from 1837 to 1840 [Oxford DNB]; Whitehouse was at UCL 1838-40. Both were members of the Royal College of Surgeons, and Mann. like Whitehouse, abandoned the medical profession in the early 1850s for other pursuits; in Mann’s case, writing. Both men had similar, wide-ranging interests; Mann wrote books on astronomy and chemistry and many articles for Chambers’s Edinburgh Journal, and was later President of the Meteorological Society at the same time as Whitehouse was a Member of Council. When in 1857 the Atlantic Telegraph Company needed a promotional pamphlet written on the workings of the cable, Mann must have been the natural choice as its author. When the Atlantic cable is in position at the bottom of the sea, telegraphic signals will be transmitted through it by induced magneto-electric currents, on account of the superior velocity this kind of electricitypossesses over the voltaic stream, as has been already explained. These currents will be called forth by a somewhat complicated agency, the primary element in which will be a voltaic combination of a very novel and ingenious kind. The primary source of the influence which will be charged with the service of Atlantic Telegraphy, will be a giant voltaic battery, of ten capacious cells, which may be appropriately termed, the “Whitehouse Laminated or Perpetual Maintenance Battery,” on account of the one marked peculiarity which especially fits it for the employment it is designed for. This battery is made upon the Smee principle, so far as the adoption of platinized silver and zinc for its plates is concerned; but it differs from every form of combination that has hitherto been in use, in having the plates of each cell so subdivided into subordinate portions, that any one of these may be taken away from the rest for the purpose of renewal or repair, without the action of the rest of the excited surface of the cell being suspended for a single moment. The battery, in fact, may be entirely renewed a hundred times without its operation having been troubled with even a passing intermission. So long as a fair amount of attention is given to the renewal of its zinc element piece-meal, it is indeed literally exhaustless and permanent. This very desirable quality is secured by a singularly simple and ingenious contrivance. The cell itself is formed of a quadrangular trough of gutta percha, wood-strengthened outside, in which dilute acid is contained, the proportion of acid to water being one part in fifteen or sixteen. There are grooves in the gutta percha into which several metal plates slide in a vertical position. These plates are silver and zinc alternately, but they are not pairs of plates in an electrical sense. Each zinc plate rests firmly at the bottom on a long bar of zinc, which runs from end to end of the trough, and thus virtually unites the whole into one continuous extent of zinc, presenting not less than two thousand square inches of excitable surface to the exciting liquid. Each silver plate hangs in a similar way from a metallic bar which runs from end to end of the trough above, the whole of the silver being thus virtually united into one continuous surface of equal extent to the face of the zinc. The zinc does not reach so high as the upper longitudinal bar, and the silver does not hang down so low as the inferior longitudinal bar. The battery is thus composed of a single pair of laminated plates, although to the eye it seems to be made up of several pairs of plates. Nature has set the example of arranging extended surface into reduplicating folds, when it is required that such surface shall be packed away in a narrow space at the same time that a large acting area is preserved, in the laminated antennae of the cockchafer. These antennae, indeed, are the types of the Whitehouse battery. If any one of these reduplicated segments of either kind of metal is removed, the remaining portion continues its action steadily, the effect merely being the same that would be produced if a fragment of an ordinary pair of plates were temporarily cut away. The silver laminae are of considerable thickness, and securely “platinated” all over; that is, platinum is thrown down upon their surfaces in a compact metallic form, and not in merely the black pulverulent state; consequently they are almost exempt from wear. Each zinc lamina is withdrawn so soon as its amalgamation is injuriously affected, or so soon as its own substance is mainly eaten away by the action of the chemical menstruum in which it is immersed, and a freshly amalgamated, or new zinc lamina, is inserted into its place. The capability of the piece-meal renewal of the consumptive element of the battery in this interpolatory and fragmentary way, is then the cause of its “perpetual maintaining” power. The perpetual maintenance batteries which will be actually used in the working of the Atlantic Telegraph have been in operation for some time, and are found to answer the expectation entertained of some by their contriver in the fullest degree. They are steadier in action, and occasion less anxiety and trouble to the attendants than any other kind of battery that has ever been brought into play; and they are of exceeding power. When the large wire ropes, or broad strips of copperplate, which are connected with their poles in the place of the ordinary uniting wire, are brought together and separated, brilliant flashes pass between them, accompanied by an abrupt and loud crackling sound. In one experiment tried to determine the heating capability of the ten cells, half an inch of the extremity of a large pair of pliers was red hot in five seconds after it had been pressed by the separated ends of the polar appendages, and several spires of a common iron screw, one- quarter of an inch thick, were in the same condition in a slightly longer time. A very remarkable illustration was afforded of the power of the human body to resist the passage of electrical currents of low intensity, upon this occasion. 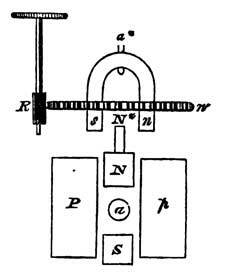 Having seen the effects produced upon the half-inch of iron, in the case of the pliers and the screw, when they were placed in the interruption of the circuit, the writer of these pages substituted his own body for the iron, by taking one of each of the continuation poles of the battery in either of his moistened hands. No sensation was experienced, but a galvanometer, placed in front of his chest, indicated that just a slight stream of the electrical influence did force its way through his person, the needle of the galvanometer being deflected from its position of neutrality by a few degrees. This part of the experiment furnishes a very simple illustration of the difference between quantity and intensity in electrical agencies. Quantity depends, in a voltaic combination, on the extent of surface which is exposed to chemical action in each pair of plates; and the heat produced in any given portion of the conducting circuit, or better still, the amount of water decomposed when similarly situated, is the approximate measure of that quantity. In the case of the Atlantic battery, the quantity of electricity generated, and the heat developed is very great, because there are two thousand square inches of each of the metallic surfaces under excitement in each cell. But notwithstanding the great quantity of electricity thus generated and made available, that quantity is of such low intensity, that it is unable to strike its way, as intense lightning really of much less quantity would, through the human frame. The intensity of a voltaic arrangement depends upon the number of its pairs of plates, or cells. If in the experiment the intensity of the electricity had been increased, without any alteration of quantity, merely by multiplying the number of the cells engaged, or by some analogous modification of instrumental agency, the body which resisted the current of the battery with such complete effect, would have been flashed through and burnt up, like the fragment of metal that had inferior powers of resistance. The flashes of light and crackling sparks produced on making and breaking contact with the poles of this grand battery, are very undesirable phenomena in one particular. They are accompanied by a considerable waste of the metal of the pole. Each spark is really a considerable fragment of the metal absorbed into itself by the electrical agent, so to speak, and flown away with by it. Lightning itself is now known to be material substance thus seized upon and converted into electrical flame. When one of the poles of the battery is drawn two or three times along the sharp angle of an iron instrument, like a pair of pliers, the opposite end of the pliers being in contact with the other pole, the sharp angle is shaved away in the midst of a shower of sparks, just as if some irresistible and adamantine-toothed file had been carried along the same course. 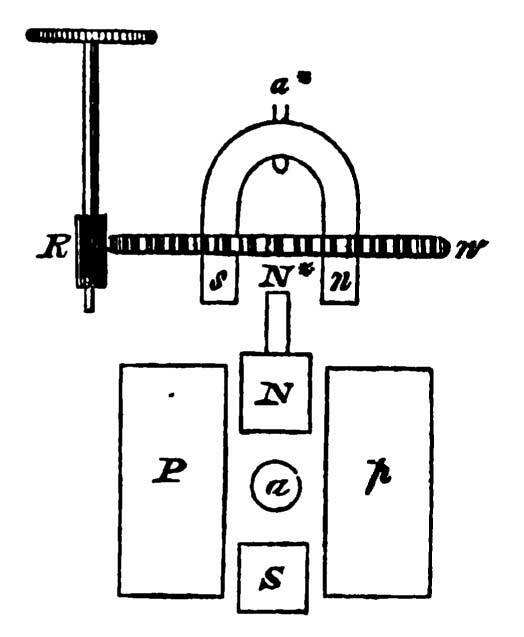 As the signals of the Telegraph will be constantly made by making and breaking contact with the poles of the battery, these sparks would prove very costly and troublesome, eating away the material of the contact-key, and what is of more importance, very soon deranging its integrity and perfection as a mechanical means of communication and transmission. The Electrician of the Company has very nearly eliminated this difficulty by a contrivance of considerable ingenuity. First he arranged a set of twenty brass springs, something of the form and appearance of the keys of a musical instrument, in opposite pairs, so that a round horizontal bar, turning pivot-ways on its own centre, and flattened at the top, could lift by an edge either of the sets of ten springs, right or left, as it was turned. This enabled the contact to be distributed through the entire length of the edge, and breadth of the brass springs, and the course of the current to be reversed, accordingly as the right or left edge (the bar being worked by a crank handle,) was raised to the right or left set of springs; the right set, it will be understood, being the representatives of one pole of the battery, and the left set of the other pole. By this arrangement four-fifths of the spark were destroyed, simply on account of the large surface of metal, through which the electrical current had to pass when contact was completed. Still there remained enough to constitute a very undesirable residue. It may be added that one of these perpetual maintenance batteries has now been constantly at work for months in a large electrotyping office in London, and has thoroughly established its reputation for unparalleled steadiness, convenience, and power. The battery is also unquestionably one of the most economical that has ever been set to work, considering the amount of service it is able to perform. It is calculated that the cost of maintaining the ten-celled battery in operation at the terminal stations on either side of the Atlantic, including all wear and tear, and consumption of material, will not exceed one shilling per hour. Thus much of the primary source of electrical power, whence the telegraphing influence will issue for the Atlantic passage. The important addition has now, however, to be made, that it will not be the direct emanation from this Titanic battery, which will really cross the Atlantic. If it were so, it would strictly be the “voltaic current” which would cross the long ocean-stretch. But it will be remembered that the voltaic current has been determined to be far more sluggish of movement than some electrical agencies, with which it stands in sympathetic relation. Consequently, this primary voltaic current will only be used to stimulate, and call up the energies of one of those fleeter messengers. The voltaic stream is sent to a piece of complicated electrical apparatus, consisting of miles of silk covered wire, rolled into almost countless coils, which envelope a bar or core of soft iron. The iron bar itself is enclosed in a sheathing of tolerably thick sheet gutta percha, and there are deep flanges moulded on the sheath to divide the coiled wire into segments, so that a more perfect separation and insulation may be maintained. First, several miles of sheathed wire of the comparatively fine No. 20 gauge is wound tightly round the core. That is a secondary passive, or to be excited coil. This coil is covered by a layer of gutta percha, and round this a mile and a half of sheathed wire of the comparatively thick No. 14 gauge is wound, arranged in 24 short lengths. That is a primary, inducing, or generating coil. The thick primary coil is placed in circuit between the poles of the voltaic battery, and receives the voltaic current when signals are to be made. Then this is what follows:—The soft iron bar in the centre of the coil becomes a very powerful temporary magnet, and the powerful magnet, in its turn, excites a current of electricity in the thin secondary coil, and that secondary induced current is caused to start off across the Atlantic through the conducting strand of the cable. It is indeed the transmission current. The voltaic current induces magnetism in the iron bar, and the magnetized bar induces an electric current in the inner coil without there being any direct communication established between its insulated wire, and either the magnet or the wire of the primary coil. The coils are thus properly double-induction coils. Electricity induces magnetism, and magnetism induces electricity, which then possesses the remarkable and valuable property of a facility and speed of motion far exceeding that of any producible simple voltaic current. So far as mere quantity is concerned, the electricity called forth in the secondary transmission coil, is less than that which is directly poured into the primary generating coil by the voltaic battery, but it is of far more intense power, and goes forth into the cable amply prepared for its work, and abundantly strong and brisk for the effort of leaping across the Atlantic in the tenth part of a second. It is peculiar to these powerful instruments to have the secondary or transmission coils bound immediately round the magnetic bar, inside of the generating coil. This arrangement is adopted because it enables the magnet to act with increased advantage upon the wire it has to make active through induction. If the transmission coil were outside the generating coil, the magnet would have to act upon the former through the latter. There are in the instruments prepared for telegraphic use, a pair of the double-induction coils placed side by side, because each of the temporarily-formed magnets inductively strengthens the force of its neighbour; if short bars are laid connective across the ends of the parallel bars, these also become magnets by induction, while the electrical currents are flowing, and in their turn re-act upon the larger bars, and make their magnetism and inducing power stronger. A short wire coil curled round one of the transverse bars, or bud-magnets, has a subordinate or affiliary current called up in it, which is necessarily simultaneous in the time of its production with the ordinary transmission or secondary current, and therefore available in various ways for experimental research. In the preparation of these double induction coils, similar care to that already alluded to has been taken to have each separate agency accurately proportioned to its co-workers, and the labour it has to perform. If by accident the current which ought to be transmitted through the entire length of one of the coils, finds its way by a shorter route, the instrument immediately becomes heated to a very considerable degree, and thus furnishes, of its own accord, a warning indication of the derangement. Although the electrical influence generated in these coils is possessed of a very much higher penetrative power than the simple voltaic current, it is nevertheless found to be advantageous not to allow it to approach in intensity to the influence which is called forth by the apparatus known under the designation of the Rhumkorff coil. The transmission current generated in these double-induction coils, on reaching the further side of the Atlantic, will of course have become somewhat faint and weak from the extent of the journey it has performed. It will not therefore be set, in this state, to print or to do hard work; but it will be thrown into a sort of sanatorium or nursery, known as the receiving instrument, where its flaggingenergies will be restored. The conducting strand of the cable will be here made continuous with a coil of wire, surrounding a bar of soft iron, which will become a temporary magnet, strong in proportion to the number of turns in the coil, whenever the current passes. This temporary magnet will have its precise polarity determined by the direction in which the electrical current passes along the wire. The pole which will be north when the current passes in one direction, will be south when the current runs the opposite way. This temporary magnet, made whenever the transmission current arrives across the Atlantic, and courses through its investing coil, will then be the base of the receiving instrument. An apparatus of a somewhat similar nature to this has been in use for some time, under the name of a relay. But the receiving instruments to be employed in the Atlantic service possess one feature which gives them a very remarkable and important advantage over the old “relay” apparatus. In the old “relay” the magnet pulled down a bar of soft iron when it was made magnetic, and when the magnetism failed, the bar was drawn back by a tolerably strong spring, so attached as to act in the opposite direction. Thus the magnet always had the opposition of the spring to overcome every time it acted, and so a great expenditure of power was necessitated. In the new receiving instrument, Mr. Whitehouse has dispensed with the spring, and adopted an arrangement which will be best understood by a reference to the accompanying rough diagram. The instrument is supposed to be seen by a vertical section made across it, as it lies along on its extended base. P p represent the two poles of the soft iron bar, which is temporarily magnetized by the transmission current. This temporary magnet is bent into a horseshoe form. Between its arms is placed a small permanent horseshoe magnet, turning right and left upon a central pivot;—a represents the position of the pivot, and N and S the situation of its north and south poles. Now north poles of magnets attract south poles, and south poles attract north. Consequently, when P is temporarily made a south pole, it attracts N, and p attracts S, and the permanent magnet is rotated upon its pivot, until the contact of P and N, and of p and S, takes place. But when P is made a north pole, it attracts S, and p attracts N, and the permanent magnet is rotated the opposite way. When the permanent magnet is rotated one way, the circuit of a small local battery is closed, and it is set to record signals; when the permanent magnet is rotated the opposite way, the circuit of the local battery is opened, and the recording work stops. The north pole of the permanent magnet is extended to N*, and is there embraced between the poles of s n of another small permanent magnet, which rotates upon a central pivot, a* being carried by a tooth-wheel w, moved by a pinion, R. This part of the instrument accomplishes a fine magnetic adjustment, by regulating the facility with which the permanent magnet obeys the polar attraction of the temporary magnet. The more s is drawn round towards the pinion, the more it tends to drag N towards P, and so to reinforce the polar power of P. When s and n are placed in a position that is perpendicular to the plane of the sketch (that is to the paper), they cease to exert any influence over the rotatory motion of the magnet N and S upon its pivot, a. In working out this magnetic adjustment, Mr. Whitehouse availed himself of the suggestion afforded by a magnet regulator Mr. Bright had contrived for the Magnetic Company’s needle-instruments some three or four years previously. The advantage of this relay, then, is that the temporary magnet has no other work to do than to make the small permanent magnet traverse upon its almost frictionless pivot. On account of this peculiarity of construction, it possesses the utmost sensibility. It may be put into vigorous action by a sixpence and a fragment of zinc placed on the moist tongue. When two or three of these instruments are scattered about in the room where the large double-induction coils are at work, they are commonly heard clicking backwards and forwards automatically, and doing a little business on their own account, although no current of any kind is thrown upon their coils. They are then merely traversing upon their pivots, obediently to the magnetic attraction of the great bars, having their magnetism successively reversed some two or three yards away, and curiously enough, are sympathetically recording, at such times, precisely the same signals and messages that the great magnets are sending off through the transmission coils. But how will these sensitive receiving instruments lead to recording work being performed? The chain, as far as it has been linked together up to the present, stands thus. A powerful voltaic current goes through a generating coil near at hand. The generating coil makes a temporary magnet. The magnet produces a transmission current in a secondary coil. The current crosses the Atlantic in the cable, and makes a temporary magnet on the farther side of the ocean. The temporary magnet works a permanent magnet hung on a pivot, so that it can traverse. The next link in the chain is this; there is a local short circuit voltaic battery standing ready near the recording instrument, and this battery has its electrical flood-gates opened when the permanent magnet traverses one way, and shut when it traverses the other. When the flood-gates are opened, the current from the local battery flows out, and prints the message it is desired to record. The perpetual maintenance batteries, double induction coils, and springless sensitive receiving instruments, designed for the work of the ocean telegraph, have all been made expressly for the work, under the eye of the electrician of the Company, and indeed, are most of them inventions for which patent rights are held. The actual recording work of the telegraph will be performed by the ordinary instrument of Professor Morse, carefully adjusted in the workshop of the Company. In this recording instrument, a ribbon of paper is unrolled from a hollow cylinder or drum by a train of clock-work, and as it is unrolled, a sharp style, magnetically directed, indents a series of dots or lines upon the paper. When the style is thrust down only for an instant as the paper is dragged along beneath, a dot is impressed. When it is kept down for a little more than an instant, a lengthened line or dash is left on the onward moving paper as a track. But how is the style thus magnetically controlled? It is held up by a strong spring. Beneath it there is a soft iron bar, which becomes a magnet whenever a voltaic current is turned on from the local battery along a coil surrounding it. Whenever the soft iron bar becomes a magnet, it is stronger than the spring, and drags down the style to make its dot or dash, as the case may be. When it ceases to be a magnet, the spring comes into play and lifts the style up, so that the paper traverses on beneath, traceless and free. The style is held down an instant, or more than an instant, accordingly as an instantaneous, or as a prolonged current is sent from the transmission coil, and therefore from the local recording battery through the short circuit; for as it has been seen, the two will be in magnetic and electrical rapport, although severed by the Atlantic’s breadth. See also The Whitehouse Perpetual Maintenance Battery.